Sometimes we make ourselves suffer and worry unnecessarily. I recently returned from a trip to remote Ethiopia to visit Gesha Village, a 500-acre coffee farm producing some of the finest coffee in the world. Before traveling, I was at the doctor getting two shots a day, more than slightly concerned about the health and safety warnings flooding the Internet about the country. My impressions upon arrival were completely opposite to what I’d imagined. People were incredibly friendly. One of the owners of Gesha Village, American-born Adam Overton, was laughing his head off at the list of vaccinations I’d endured. He’d had almost none of them before moving to Ethiopia to start the farm in 2011. I was inspired by the Gesha story because the couple who started this project has heart. They are not just business people, they care about their work and those affected by it. As a social entrepreneur, I strongly believe it’s not enough to just buy and sell, there has to be an emotional connection to what you are doing. Gesha Village is named after the indigenous coffee variety grown there, which has a floral, deliciously sweet character. Overall, I felt incredibly lucky to have had this experience, though the travel was tough, and the isolation was new for me. From the capital of Addis Ababa, I flew another hour to Jima, then took a 15-hour car ride to reach Gesha Village. There was no 7-11, no Internet, and limited electricity. At the beginning, camping in the village, I freaked out a bit…and then embraced the peace. At an elevation of 1900 meters, there are no mosquitoes in this dense forest, totally different from our buzzing Filipino forests. One of the most surprising—and alarming—things I learned is that Ethiopians don’t get to enjoy their own delicious coffee. By law, all coffee from grades 1 to 4 (of 5 grades on the coffee scale) are exported, with the locals consuming only the beans with the most defects. This struck me as so sad, to have such heavy regulations you can’t savor your own national treasures. I feel so lucky that we Filipinos can fully enjoy our domestic harvests. Thank goodness no one tells us how much mango or banana we can eat at home! My Gesha mission was multifold, first to source some coffee beans for the National Barista Championship and develop new ways of fully utilizing coffee byproducts to share with Filipino farmers back home. For Philippine coffee farmers, the harvest occurs just once a year. Many workers have to take side jobs to make ends meet, coming to Manila in the off season as domestic helpers or leaving home as an OFW (Overseas Filipino Worker). I want to show these farmers what else coffee trees can offer. Leaves and flowers can be turned into a tasty tea, for example. We experimented with producing syrups and jams from the trees, an idea the Gesha Village farmers were excited about. All of this means we can fully utilize nature and keep coffee farming sustainable. I’m also very interested in starting a similar community-building project here in the Philippines. 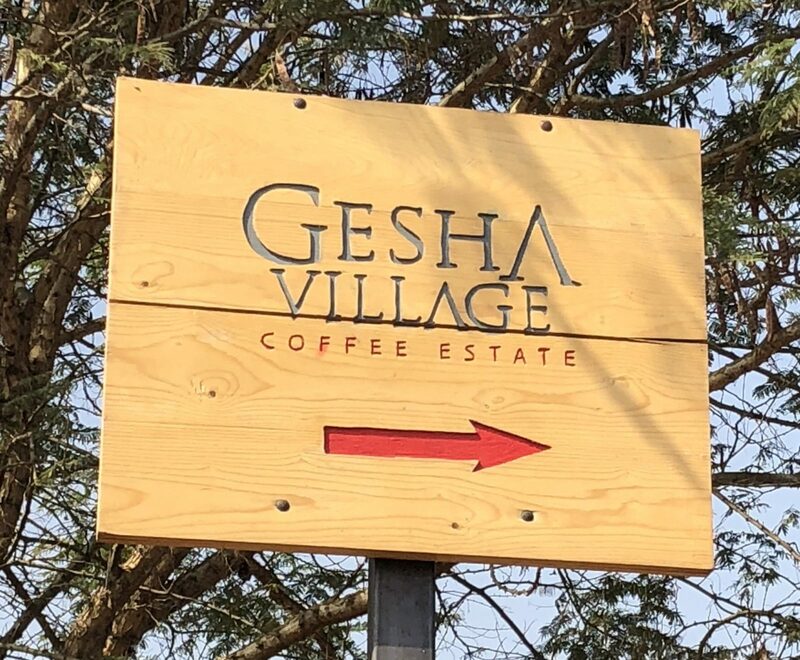 Gesha Village is based in the Gori Gesha forest reserve, a green expanse that wasn’t being used for anything productive before the project. We have the same sort of land in this country that is prime for agro-forestry. If we can pull this off in La Trinidad or somewhere domestically, that would really be something. Imagine experiencing a bit of Africa in the Philippines! Plus, Filipino farmers currently sell their coffee for 200-280 pesos per kilo, but Gesha coffee can retail for up to $70 per kilo. What an amazing benefit this would be for our local farmers. Look at all that ripe coffee cherries on African drying beds.